Jigs Mayuga is one of the most famous makeup artists here in the Philippines, doing the faces of celebs like Bea Alonzo and Andi Eigenmann. He looks scary and intimidating, but I swear he is such a nice guy. We got to talking at a party one time and I even got his number! Stupid me didn't save his name to my phone though, was too much in awe. 0_0 I hope to feature him at Project Vanity one day! Maybe I'll get a chance at his workshop for Digital Traincase! 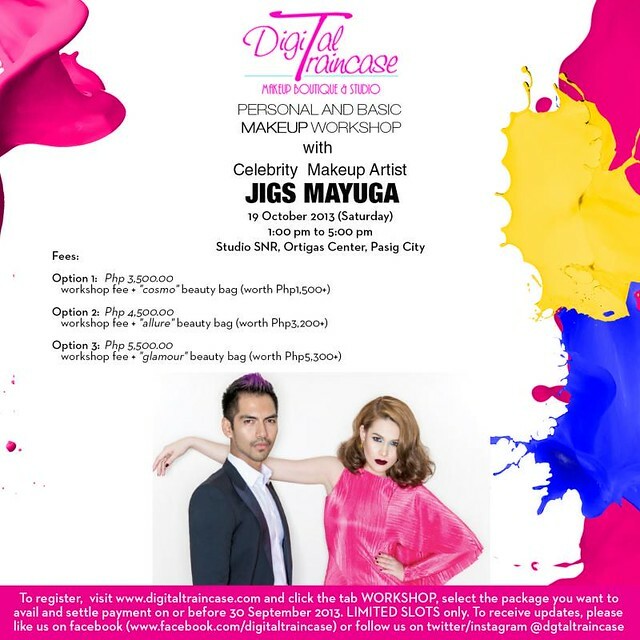 Yes, Jigs will be conducting a Basic Makeup Workshop with your favorite online beauty destination. It will happen on October 19, Saturday, 1-5 PM in Studio SnR. Learn all about his trademark techniques and holistic beauty advice. I'm pretty psyched about it as I am coming to learn too! Let's meet up? There are still slots available! You can sign up for the workshop here.